The Texas A&M Aggies football program represents Texas A&M University in the sport of American football. The Aggies compete in the Football Bowl Subdivision (FBS) of the National Collegiate Athletic Association (NCAA) and the Western Division of the Southeastern Conference (SEC). Texas A&M football claims three national titles and eighteen conference titles. The team plays all home games at the newly redeveloped Kyle Field, a 102,733-person capacity outdoor stadium on the university campus. Jimbo Fisher is currently the team's head coach. Texas A&M first fielded a football team in 1894, under the direction of head coach F. Dudley Perkins. The team compiled a 1–1 record. W. A. Murray served as A&M's head coach from 1899-1901, compiling a record of 7–8–1. From 1902-1904, J. E. Platt served as A&M's head coach, his teams compiling a record of 18–5–3. From 1909-1914, A&M compiled a 38–8–4 record under head coach Charley Moran. Moran's 1909 team finished undefeated, and all but one of Moran's other seasons the Aggies only lost one game each year. Under head coach Edwin Harlan, the Aggies compiled a record of 12–5 in two seasons and joined the Southwest Conference. Dana X. Bible became Texas A&M's head coach in 1919, leaving LSU, and under his tutelage the Aggies compiled a record of 72–19–9 in ten seasons. Bible's 1919 Texas A&M Aggies football team, which was undefeated, untied, and outscored its opposition 275–0, was retroactively named a national champion by the Billingsley Report and the National Championship Foundation. In the 1922 Dixie Classic, Bible made his most visible and lasting impression in his A&M career when he began the Twelfth Man Tradition. Bible had a roster of only eighteen players, who had to play both offense and defense against the heavily favored Centre College. He lost three players to injuries early in the game, but the Aggies took the lead. Fearing more injuries and a possibility of having to forfeit the game for lack of men, Bible called upon a reserve halfback, E. King Gill, who was in the press box running stats for the team, to suit up and be ready if needed. The Aggies wouldn't need Gill's help to win, but since then A&M students stand throughout football games to show their willingness to play if needed. Bible departed the Aggies after the 1928 season to accept the Nebraska head coaching position. After Bible's departure, A&M brought in Matty Bell from TCU to lead the Aggies football program. Under Bell's tutelage, the Aggies compiled a record of 24–21–3. However, the Aggies did not play up to the standards set by Dana Bible's tenure, and Bell had left for SMU after five seasons. Homer Norton was hired away from Centenary to replace Bell in 1934. A&M enjoyed great successes under Norton. The 1939 Texas A&M team went 11–0, beating Tulane in the Sugar Bowl, and was named a national champion. Norton's record at Texas A&M was 82–53–9, giving him the second most wins of any coach in Texas A&M Aggies football history. Among the many stars that Norton developed were John Kimbrough and Joe Routt. Norton was fired in 1947 when his team went 3–6–1 and lost to archrival University of Texas for the eighth straight year. In December 1947, Harry Stiteler was promoted from running backs coach to head coach for the Texas A&M football team following the firing of Homer Norton. In Stiteler's first season as head coach, the Aggies failed to win a game, accumulating a record of 0–9–1. For the 1949 season, the Aggies won only one game and had a record of 1–8–1. Despite the poor record in his first two seasons, Stiteler developed a reputation as a good recruiter. In 1950, Stiteler turned the program around with a 7–4 record, including impressive wins over Arkansas (42–13) and SMU (25–20) and a 40–20 win over Georgia in the Presidential Cup Bowl at Baltimore. The 1950 team had the best record of any Texas A&M football team in the first decade after World War II (1945–1954). "We believe that whatever happened to Mr. Stiteler was a personal matter and it should have remained that. A lot of us boys came to A. and M. in 1948 not because A. and M. had won games but simply because of Harry Stiteler and his character. He has never ceased to set us that same example in the years we have played and worked for him." In three years as the head coach at Texas A&M, Stiteler compiled a record of 8–21–2. Raymond George, previously USC's defensive line coach, was hired as the 17th head coach of the Texas A&M Aggies after the Stiteler scandal. He served as head coach for three seasons, from 1951 to 1953, during which time the Aggies produced a total record of 12-14-4. Among A&M's notable wins during this time period were victories over Bud Wilkinson's Oklahoma Sooners, Henry Russell Sanders' UCLA Bruins and Bear Bryant's Kentucky Wildcats. George resigned as the Aggies head coach following the 1953 season. Legendary coach Bear Bryant arrived in College Station after successful head coaching tenures at Maryland and Kentucky, signing a contract worth $15,000 per year. The Aggies suffered through a grueling 1-9 record in Bryant's first season, which began with the infamous training camp in Junction, Texas, during which time many Aggie football players quit the team. The "survivors" were given the name "Junction Boys." Two years later, Bryant led the team to the Southwest Conference championship with a 34–21 victory over Texas in Austin. The following year, star running back John David Crow won the Heisman Trophy and the Aggies were in title contention until they lost to Rice Owls. Bryant attempted to integrate the all-white Texas A&M squad. "We'll be the last football team in the Southwest Conference to integrate," he was told by a Texas A&M official. "Well," Bryant replied, "then that's where we're going to finish in football." After the 1957 season, having compiled an overall 25–14–2 record at A&M, Bryant left for Alabama, his alma mater, where he would cement his legacy as one of the greatest, if not the greatest, college football coach of all-time. A&M next turned to Iowa State head coach Jim Myers for its head coaching position. Under Myers, the Aggies struggled mightily, compiling a 12–24–4 record. The Aggies failed to win more than four games in a single season. The fallout that ensued from fans, boosters and the administration led Myers to join Tom Landry's Dallas Cowboys staff as an assistant coach. Hank Foldberg was hired as the Aggies head coach after Myers' departure, and brought with him high hopes that Aggie success would return. However, the struggles remained, in the form of a 6-23-1 record in three seasons. Foldberg was replaced after the 1964 season. Fresh off helping Bear Bryant and Alabama win the 1964 national title as an assistant coach, Gene Stallings, one of the "Junction Boys", was named the head coach of his alma mater at the age of 29. The Aggies struggles persisted under Stallings. 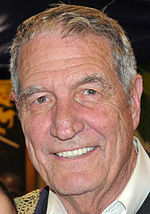 Texas A&M compiled a record of 27–45–1 in Stallings' seven seasons. However, the Aggies won the Southwest Conference in 1967, Stallings' only winning season at A&M. At the end of that season, A&M beat Alabama in the Cotton Bowl. He was fired at A&M following the 1971 season, but, like his mentor Bryant, would go on to become Alabama's head coach in the 1990s and solidify a Hall of Fame career there. Texas offensive coordinator Emory Bellard became the Aggies' head coach in 1972 and brought with him the wishbone offense. In his seven years at Texas A&M, he finished with a record of 48–27 and three top-15 finishes. Acting as his own offensive coordinator, Bellard hired former high school football coaches to assist him as backfield coaches. Bellard's first two seasons at Texas A&M were difficult, as his Aggies finished 3–8 and 5–6, respectively. In 1974, with a pair of his own recruiting classes suited to run the wishbone formation, the Aggies went 8–3, then followed it up with two 10–2 seasons, including a pair of wins over Texas and three consecutive bowl game appearances. After starting the 1978 season 4–0, Bellard resigned mid-season after two consecutive losses: 33–0 to Houston and 24–6 to Baylor. Tom Wilson was promoted from offensive coordinator to head coach of the Aggies following Bellard's resignation. The Aggies enjoyed moderate success under Wilson's tutelage, compiling a record of 21-19 and an Independence Bowl victory in 1981. However, the mediocrity did not sit well with the administration, and Wilson was fired after the 1981 season. On January 19, 1982, Jackie Sherrill was hired away from Pittsburgh by A&M as the replacement for Tom Wilson, signing a record six-year contract over $1.7 million. Sherrill was the head coach of the Texas Aggies for seven seasons, from 1982 to 1988. While head coach at A&M, Sherrill started the tradition of the "12th Man Kickoff Team", this tradition is still observed by A&M today only in a significantly scaled back form, including a single walk-on rather than an entire return team unit. In Sherrill's seven seasons, A&M compiled a 52-28-1 record. A&M also won three consecutive Southwest Conference championships during Sherrill's tenure, in 1985, 1986 and 1987. As a result, the Aggies played in the Cotton Bowl Classic at the end of each season, defeating Auburn 36–16 on January 1, 1986 and Notre Dame 35–10 on January 1, 1988, and losing to Ohio State 28–12 on January 1, 1987. He is also one of the few coaches to leave Texas A&M with a winning record against the Longhorns, winning his last five against Texas after losing his first two. However, he only won two out of seven games versus Texas A&M's other conference rival, Arkansas, in that same time span. In 1988, Texas A&M was put under probation by the NCAA for a period of two years. Violations included improper employment, extra benefits, unethical conduct and lack of institutional control. Sherrill was not personally found guilty of any infractions. However, in December 1988, Sherrill resigned. In December 1988, R.C. Slocum was promoted from defensive coordinator and named head coach of the Aggies. During Slocum's 14 years as head coach, the Aggies compiled a record of 123–47–2, making Slocum the winningest coach in Texas A&M history. During his career, Slocum never had a losing season and won four conference championships, including the Big 12 (the Southwest Conference was renamed in 1996) title in 1998 and two Big 12 South Championships, 1997 1998. Additionally, he led the Aggies to become the first school in the Southwest Conference history to post three consecutive perfect conference seasons and actually went four consecutive seasons without a conference loss. Slocum reached 100 wins faster than any other active coach. A&M's Kyle Field become one of the hardest places for opponents to play during Slocum's tenure, losing only 12 games at home in 14 years. For over a year, A&M held the longest home-winning streak in the nation, losing in 1989 and not again until late in 1995. In the 1990s, A&M lost only four times at Kyle Field. Slocum was named SWC Coach of the Year three times during his tenure as head coach. A&M's "Wrecking Crew" defense led the Southwest Conference in four statistical categories from 1991 through 1993 and led the nation in total defense in 1991. Over 50 Texas A&M players were drafted into the NFL during Slocum's career as head coach. A&M turned to Alabama head coach Dennis Franchione to replace the ousted Slocum. Franchione brought the majority of his coaching staff from the Crimson Tide for the 2003 season. Franchione signed a contract that was set to pay him a yearly salary of $1.7 million through 2010. The Aggies finished the 2003 season with a 4–8 record, including a nationally televised 77–0 loss to Oklahoma, the worst loss in A&M's history. The season also marked the first losing season for the Aggies after 21 years. In the 2004 season, Franchione attempted the rebuilding process as the team improved to a 7–5 record, and a 5–3 record in conference play, including a 35–34 overtime loss to unranked Baylor, ending a 13-game winning streak the Aggies had over Baylor and a 32–25 overtime win over the then #25 Texas Tech at Kyle Field, snapping a 3-game skid to the Red Raiders. The Aggies ended up advancing to the Cotton Bowl Classic to play #17 Tennessee, but lost 38–7. Following the bowl game, A&M officials extended Franchione's contract through 2012 and raised his salary to $2 million. In June 2005, prior to the 2005 season, Franchione donated $1 million to the A&M athletic department. The donation went toward the construction of an indoor practice facility, which is now located adjacent to Kyle Field. In the 2005 season, Franchione's Aggies, who were ranked 17th in the preseason AP Poll, regressed to a 5–6 record. The 2005 Aggie defense ranked 107th nationally (out of 119 NCAA Division I-A teams) and allowed 443.8 yards per game. This prompted Franchione to dismiss defensive coordinator Carl Torbush. Franchione then hired former Western Michigan head coach Gary Darnell to replace Torbush. In the 2006 season, the Aggies again rebounded under Franchione, posting a 9–3 regular season record that included Franchione's first win over rival Texas. The 9–3 record also marked the most wins for A&M since 1998. However, in that season's Oklahoma game, which ESPN's College GameDay visited, Franchione was criticized by fans for making a field goal call with 3:28 left in the game. The 18th-ranked Sooners ended up defeating the 21st-ranked Aggies, 17-16. In the postseason, the Aggies faced 20th-ranked California in the Holiday Bowl and lost 45-10. During the 2007 season, Franchione was discovered selling a secret email newsletter, which violated two NCAA rules and one of the Big 12's "Principles and Standards of Sportsmanship". After the Aggies' 34-17 loss to unranked Miami in September 2007, Franchione's coaching abilities were questioned. 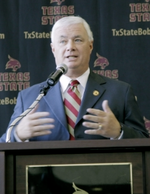 Several news outlets reported that Franchione will not return for the 2008 season. After Franchione led the Aggies to a 38-30 victory over 13th-ranked Texas, he announced his resignation. Defensive coordinator Gary Darnell was named the interim head coach. Darnell led the Aggies to a 24-17 defeat at the hands of Penn State in the Alamo Bowl. Mike Sherman was hired away from his post as offensive coordinator of the NFL's Houston Texans to replace Franchione. Sherman signed a 7-year contract that at the time paid him $1.8 million annually. Sherman abandoned the zone read option offense run by Franchione and his coaching staff, and installed a pro-style system. A&M used a balanced offense run primarily out of the pro-style formations. Sherman's quarterbacks at A&M were Stephen McGee and Ryan Tannehill, both of whom would go on to be drafted into the NFL. After two straight losing seasons, the Aggies started the 2010 season 3–3 but won their final six games and earn a share of the Big 12 South Division title. #18 Texas A&M went on to play #11 LSU in the Cotton Bowl. Texas A&M lost 41-24 to end the season at 9-4. After the 2010 season, A&M signed Sherman a contract extension through the 2015 season. His salary was raised to $2.2 million. In 2011, the Aggies began as a top 10 ranked team, but fell out of the polls after losing four games, three of which had double-digit half-time leads. Three of those four losses were to teams later ranked among the top ten in the nation. On November 19, 2011, the Aggies defeated Kansas 61-7 and became bowl-eligible for a third straight season. Five days later, on November 24, 2011, they would lose at home to Texas by a score of 27-25 on a last-second field goal, in what would be the last game of the rivalry for the foreseeable future, as the Aggies were to join the SEC beginning in 2012. It was the Aggies' sixth loss of the season, and the fifth in which they held a second-half lead of two or more scores. Sherman was fired by Texas A&M on December 1, 2011. The Aggies compiled a record of 25–25 during Sherman's four-year tenure. On December 13, 2011, A&M hired Houston head coach Kevin Sumlin as the program's 28th head football coach. Sumlin was the first African American head coach in Texas A&M football history. In 2012, Sumlin led the Aggies to an 11–2 record, including victories over then-#1 Alabama, and #11 Oklahoma in the AT&T Cotton Bowl. Starting quarterback Johnny Manziel won the Heisman Trophy. The Aggies finished the 2012 season ranked in the top 5 of both the Coaches Poll and the AP Poll. Texas A&M also lead the SEC in total offense, total scoring offense, total rushing yds, and led the nation in third down conversion percentage. Kevin Sumlin and the Texas A&M Aggies became the first SEC team in history to amass over 7,000 yds in total offense. Sumlin's 2013 Aggies, led by Manziel, finished with a 9–4 record, which included a victory over Duke in the Chick-fil-A Bowl. On November 30, 2013, A&M signed Sumlin to a six-year, $30 million contract extension. For the 2014 season, the Aggies came out strong to begin the season, winning their first 5 games before stumbling mid-season to three top 10-ranked teams, including a 59-0 loss to #7 ranked Alabama. The Aggies finished the season 8–5 overall and 3–5 in SEC play. With the Liberty Bowl victory over West Virginia, the Aggies won four straight bowl games for the first time in program history. After the season, which was marred by defensive struggles, Sumlin dismissed his defensive coordinator, Mark Snyder, and replaced him with John Chavis. In 2015, A&M again finished 8–5. The season was marked by a strong start with struggles to close the season. A&M finished the season with a loss to Louisville in the Music City Bowl. Sumlin led the Aggies to a third consecutive 8–5 mark in 2016. The season was again marked a strong start with another late-season collapse, as A&M began the season 6–0, but losing four of its final five games. Texas A&M finished the 2016 season with a loss to Kansas State in the Texas Bowl. Sumlin started off the 2017 season by surrendering a 34-point lead to UCLA. Sumlin was fired from the position on November 26, 2017 after his team finished 7–5. Sumlin finished 51–26 at A&M and with a 25–23 record in the SEC. Despite A&M football's struggles during the Sumlin era, the program was recognized by Forbes in August 2018 as the most valuable in the country, based on average revenue and profit figures from the 2014–16 seasons. On December 4, 2017, Florida State head coach Jimbo Fisher was formally introduced as the Aggies head coach. A splashy hire, Fisher arrived in College Station after a very successful eight-year run at FSU, leading the Seminoles to three Atlantic Coast Conference championships, six ten-win seasons, the 2013 national championship and coached Heisman Trophy winning quarterback Jameis Winston. A&M signed Fisher to a 10-year contract worth a total base salary of $75 million, the most lucrative contract in terms of guaranteed money signed by a newly hired head coach in college football history. During his first season, Fisher led the Aggies to an 8–4 record. The season included a notable seven-overtime victory over then-No. 7 LSU. The combined 146 points scored during the game broke the NCAA FBS record for the most points scored in a game, the most points scored in a losing effort (72 by LSU), and tied the record for the most overtimes along with multiple school records for both sides. The 1919 team finished 10–0–0 and was not scored upon, earning a retroactive national title by ten selectors, including the Billingsley Report and National Championship Foundation. Other systems retroactively award the 1919 National Championship to either Notre Dame or Harvard. The 1927 team finished 8–0–1, with a tie against TCU in Fort Worth, Texas, earning a retroactive national title awarded by the Sagarin Rating and the Sagarin ELO-Chess. In 1939, the undefeated Aggies were voted No. 1 by the AP Poll shortly after its inception along with No. 1 in 8 of the 12 other major polls, after the 1939 season. The Aggies have won 18 conference championships;. The first 17 were Southwest Conference championships, and the most recent was the Big 12 Championships won in 1998. Former head coach R.C. Slocum gives a gig 'em with his Big 12 Championship ring. The Aggies were previously members of the Big 12 South between its inception in 1996 and the dissolution of conference divisions within the Big 12 in 2011. The Aggies joined the SEC as members of the SEC West starting in 2012. Texas A&M has participated in 40 bowl games. The Aggies have a bowl record of 18–22 (.450). During their 81 years in the Southwest Conference, the Aggies went 12–10 (.545) in bowl games, winning their AP National Championship in 1939. During their 16 years in the Big 12 Conference, the Aggies went 2–9 (.182) in bowl games. Since joining the Southeastern Conference in 2012, the Aggies have gone 4–3 (.571) in bowl games. Texas A&M and LSU were both members of the Southern Intercollegiate Athletic Association from 1903–1908 and 1912–1914 and are both currently members of the SEC l. The Aggies first played the Tigers in College Station in 1899, winning 52–0. The Tigers are the Aggies' seventh-oldest collegiate-football rival. Over the years, the two teams have built good home-field advantages, and the series' record is reflective of these reputations. The Aggies are 7–4–1 in College Station, 10–25–1 in Baton Rouge, and 3–4–1 at neutral sites (including the losses in the 1944 Orange Bowl in Miami and the 2011 Cotton Bowl in Dallas). Through 1923, the Aggies built a 7–3–2 advantage (which included neutral site games in New Orleans in 1908, Houston in 1913, Dallas in 1914, Galveston in 1916, and San Antonio in 1917). The Aggies and Tigers next played every year from 1942 to 1949 during the regular season with all of the games held in Baton Rouge. The Aggies were 2–7 in those match-ups with LSU winning the last five. In addition to the regular season match-up in 1943, the Aggies and Tigers also faced each other in the first bowl match-up of their rivalry. Though the Aggies won the regular season game 28–13, the Tigers won the January 1, 1944, Orange Bowl 19–14. The Aggies and Tigers met twice more in 1955 and 1956 with the Aggies taking both match-ups (the 1955 game was held at a neutral site in Dallas, and the 1956 game was held in Baton Rouge). From 1960 to 1975, the Aggies and Tigers produced the most consecutive match-ups of the series. The Aggies were 3–12–1 over this span, with all games in Baton Rouge to allow Texas A&M to take home a larger gate than it would have earned playing in College Station. After an eleven-year absence, the rivalry was renewed in 1986 and continued until their last regular season meeting in 1995, this time with the games alternating between Baton Rouge (even-numbered years) and College Station (odd-numbered years). The Aggies were 6–4 over this span, winning the last five meetings - four of which were against LSU teams coached by former Aggie Curley Hallman - and winning six of the last seven meetings. From 1996 through 2011, the Aggies and Tigers faced each other only once, in the Cotton Bowl Classic. It was only the second time the teams faced each other in a bowl game. The Tigers won 41–24. The series resumed in 2012, due to the Aggies joining the SEC. LSU won the first ever SEC matchup 24-19 at College Station. In 2013, #22 LSU won 34–10, Texas A&M's first SEC road loss. In 2014, they played on Thanksgiving night for the first time in the series history. The last time LSU played on the holiday was 1973. LSU beat Texas A&M 23-17 at College Station. The Tigers continued their dominance of A&M in 2015 (19-7 at Baton Rouge), 2016 (54-39 at College Station), and 2017 (45-21 at Baton Rouge). Texas A&M took the 2018 matchup 74-72 in the highest scoring game and longest game in NCAA Division I history. Starting in 2014, the Aggies became LSU's final regular season opponent. Arkansas, which had been LSU's final regular season opponent from 1992 through 2013 (except in 2001 due to LSU's game vs. Auburn being rescheduled to the end of the regular season in the wake of the September 11 terrorist attacks) now plays Missouri the same weekend of the A&M-LSU game. Over the life of the series, the Aggies have claimed the largest margin of victory with a 63–9 final score in 1914 (the Aggies also have the next two largest margins of victory with the 52–0 win in 1899 and 47–0 win in 1922). The Aggies have shut-out the Tigers 7 times (including the Aggies' non-university recognized National Championship Season of 1917 when they did not surrender a point during 8 games, and beat the Tigers 27–0). The Tigers have shut-out the Aggies 9 times (including the Tigers' non-university recognized National Championship season of 1908, when they beat the Aggies 26–0, and the Tigers' non-university recognized National Championship season of 1962, when they beat the Aggies 21–0). Add to those totals the game in which the Aggies and Tigers shut each other out 0–0 in 1920. The Tigers hold the series' longest winning streak of 6 games from 1960 to 1966 and 2011 to present. The 1960 winning streak was part of a 10-game unbeaten streak for the Tigers from 1960 to 1969 which included a 7–7 tie in 1966. From 1945-1973 was the most dominant span by either team in the series history. LSU was 17-3-1 vs Texas A&M during this span. The Aggies first played the Razorbacks in 1903. From 1934–1991, the two teams played annually as Southwest Conference members. In 1991, however, Arkansas left the Southwest Conference to join the Southeastern Conference. Arkansas leads the all-time series 41–30–3. On March 10, 2008, officials from both schools announced the revival of the series, which recommenced on October 3, 2009. The game is played at Cowboys Stadium, which was initially expected to hold about 80,000 fans. The game is dubbed "The Southwest Classic", which pays homage to both schools' past relationship to the Southwest Conference. The initial agreement between the two schools allows the game to be played for at least 10 years, followed by five consecutive four-year rollover options, allowing the game to be played for a total of 30 consecutive seasons. Once the Aggies joined the SEC, the agreement with Cowboys Stadium came to an end because the SEC does not allow its members to entertain potential recruits at neutral-site games. However, the SEC has removed this recruiting rule, and the Aggies and Razorbacks will again move the rivalry to AT&T Stadium in 2014. (cf. Georgia and Florida, which play at a neutral site, do not intend to entertain recruits at that site.) The agreement is expected to last at least 11 seasons, or through the 2024 football season. Over the life of the series, the Aggies have shut out the Razorbacks 10 times, and been shut out 9 times. The Aggies hold the largest margin of victory with a 58–10 win in College Station on September 29, 2012 (the Aggies also hold the second-largest margin of victory with a 41-0 win in College Station in 1942). The Razorbacks hold the longest winning streak in the series of 9 games from 1958 to 1966. This is a protected permanent cross-divisional series in the SEC. This series was started because of the expansion of the conference in 2012, which added the Missouri Tigers and Texas A&M Aggies. For the first two years Texas A&M played Missouri as their cross-divisional rival since both came from the Big 12 Conference, but in 2014 it was announced that Arkansas would become Missouri's new permanent rival and Texas A&M would then play South Carolina. The Texas-Texas A&M rivalry dates back to 1894. It is the longest-running rivalry for both teams. It ranks as the third most-played rivalry in Division I-A college football, and the most-played intrastate rivalry. However, as rivalries go, it's not a particularly close one: Texas beats Texas A&M twice for every Aggie win—the all-time record is Texas 75 wins–Texas A&M 37 wins, five ties. Most of these lopsided victories occurred prior A&M's transition from all male military school, and the rivalry has been fairly even since. Until the rivalry ended in 2012, the two teams played each other every year since 1894 with the exception of six seasons [1895 (when the Aggies did not field a team), 1896, 1897, 1913, and 1914]. During some seasons, the Aggies and Longhorns played each other twice. Each school mentions the other in its fight song (Texas with "and it's goodbye to A&M" in Texas Fight, and the Aggies singing "Goodbye to Texas University, so long to the orange and the white" as the opening line of the second verse of the Aggie War Hymn), and "saw Varsity's horns off" about Texas in the chorus. The football series between the two universities is the third longest running rivalry in all of college football. Since 1900, the last regular season football game is usually reserved for their matchup. Each school has elaborate pre-game preparations for the annual football clash, including the Aggie Bonfire and the Hex Rally. Texas has a unique lighting scheme for the UT Tower after wins over Texas A&M. In the past, mischief has preceded the annual game, such as the "kidnapping" of Bevo. Though the Longhorns lead the series overall (76-37-5), the series has been much closer since 1965 (when Texas A&M dropped compulsory participation in the Corps of Cadets). Since that time, the Aggies have accumulated 20 wins to 27 losses. During the last 40 meetings (from 1972—when the NCAA introduced scholarship limitations—to the present), the series is nearly even at 19–21. The Aggies best years in recent times were from 1984 to 1994 when they won 10 out of 11 games, losing only in 1990 by one point. Over the life of the series the Aggies have shut out the Longhorns 13 times, and have been shut out 27 times (including scoreless ties in 1902, 1907, and 1921). However, since 1961, neither team has been shut out. The Aggies and Longhorns have never had a game decided in overtime. The Longhorns hold the largest margin of victory with a 48–0 win in Austin on October 22, 1898 (the second meeting in the series). The Longhorns also hold the series' longest winning streak of 10 games from 1957 to 1966. In addition, the Longhorns had an 11-game unbeaten streak from 1940 to 1950 that included a 14–14 tie in 1948. In the 75 meetings since 1936 when the Associated Press College Poll began, the Aggies and Longhorns have faced each other 59 times when one or both teams have been ranked (the Aggies have been ranked 25 times, whereas the Longhorns have been ranked 44 times). In those 59 meetings, the lower-ranked or unranked team has won 11 times (the Aggies did it six times—1951, 1979, 1984, 1999, 2006, and 2007; the Longhorns did it five times—1941, 1955, 1957, 1974, and 1998). The Aggies first played the Baylor Bears in 1899, and competed with them annually since 1945. It is the Aggies' eighth-oldest collegiate-football rivalry, and their third most played behind TCU and Texas. The rivalry is nicknamed the Battle of the Brazos, a term coined after the Brazos River, which flows by the two schools which are only 90 miles (145 km) apart. Texas A&M leads the series 68–31–9. The Aggies' 68 wins against the Bears is the highest number of wins that the Aggies have accumulated against any team. From 1960-1990 the rivalry was very competitive as A&M won 16 times, Baylor won 13 times, and 2 games ended in ties; while many of the games were decided by 7 points or less. Over the life of the series, the Aggies have shutout the Bears 29 times (including scoreless ties in 1903, 1923, 1932, and 1936). The Bears have shutout the Aggies 11 times (including those same scoreless ties). The Aggies hold the largest margin of victory with a 73–10 win in College Station on October 11, 2003, as well as the second-largest margin of victory with a 53–0 win in College Station in 1912. The Aggies hold the longest winning streak in the series of 13 games from 1991 to 2003. That winning streak is also part of an 18-game unbeaten streak for the Aggies from 1986 to 2003 (the Aggies and Bears played to a 20–20 tie in 1990). As with the Texas Longhorns rivalry, the Baylor rivalry was put on hold after the 2011 season with the Aggies decision to leave the Big 12 Conference. When A&M announced its decision to leave the Big 12 and join the SEC in 2011, then-Baylor president Kenneth Starr filed suit in federal court in an attempt to block A&M from moving. Eventually the lawsuit was dropped, and soon thereafter, Missouri announced it was joining A&M in departing the Big 12 for the SEC. The Aggies first played the Red Raiders in 1927. The Aggies lead the all-time series 37–32–1. Over the life of the series, the Aggies have shutout the Red Raiders four times, and the Red Raiders have shutout the Aggies four times. The Aggies hold the largest margin of victory with a 47–6 win in College Station on November 28, 1927. The Aggies and Red Raiders each have win streaks of six games, which are the longest in the series (the Aggies' streak included the 1927 and 1932 games as well as the games from 1942 to 1945; the Red Raiders' streak was uninterrupted from 1968 to 1973). The Texas A&M/TCU rivalry began in 1897 and is the Aggies' third-oldest collegiate-football rivalry (behind the Texas A&M/Texas rivalry which began in 1894, and the Texas A&M/Austin College rivalry which began in 1896). The Aggies have accumulated 56 wins against the Horned Frogs (which is their second-highest total against any collegiate program). Though the Aggies no longer play the Horned Frogs annually since the Southwest Conference disbanded in 1996, this series is still notable because it contains the longest, active winning streak that the Aggies have against any opponent, 24, with the last win coming on December 28, 2001, in the Galleryfurniture.com Bowl, played in the Astrodome in Houston, Texas. The Horned Frogs have not beaten the Aggies since October 21, 1972, when they won in College Station with a final score of 13–10. Adding further intrigue to this series is the fact that the Aggies' National Championship Season of 1939 succeeded the Horned Frogs' National Championship Season of 1938. Over the life of the series, the Aggies have shutout the Horned Frogs 21 times, and been shutout 9 times (including scoreless ties in 1909 and 1927). The Aggies hold the largest margin of victory with a 74–10 win in College Station on November 22, 1986 (the Aggies also hold the next ten-largest margins of victory, with each ranging from 34 to 56 points). The Aggies' current winning streak of 24 games from 1973 to 1995 and including the 2001 galleryfurniture.com Bowl is the longest in the series. At a yell practice before the 1930 TCU game, A&M Board of Regents member Pinky Downs '06 shouted, "What are we going to do to those Horned Frogs?" His muse did not fail him as he improvised, borrowing a term from frog hunting. "Gig 'em, Aggies!" he said as he made a fist with his thumb extended straight up. And with that the first hand sign in the Southwest Conference came into being. The "Hook 'em Horns" cheer was also invented by a UT cheerleader prior to the November 12, 1955 UT-TCU game. TCU wound up winning both of these historic games. Texas A&M Football has nine players who have won a total of nineteen trophies: John David Crow won the Heisman Trophy in 1957; Dat Nguyen won the Lombardi Award and Chuck Bednarik Award in 1998; Von Miller won the Butkus Award in 2010; Randy Bullock won the Lou Groza Award in 2011; redshirt freshman quarterback Johnny Manziel won the Heisman Trophy, the Manning Award, AP College Football Player of the Year, and the Davey O'Brien Award in 2012; Luke Joeckel won the Outland Trophy in 2012; Myles Garrett won the Bill Willis Award in 2015; Trevor Knight won the Wuerffel Trophy in 2016, and Braden Mann won the Ray Guy Award in 2018. In the years since 1889, several organizations and publications have recognized the top players in the nation by naming them to All-America teams. To be considered an All-American, a player needs to be named to the first-team on at least one of the lists of these organizations. In addition, the NCAA further recognizes certain players by honoring them with the "Consensus" All-American title. At present, the Consensus honor is determined by referencing the first, second, and third teams of five organizations and assigning a varying amount of points for each time a player appears on one of those five lists. The points are totaled and the player with the most points at his position is awarded the Consensus honor. The five organizations whose lists are used for the Consensus determination are the Associated Press (AP), American Football Coaches Association (AFCA)., Football Writers Association of America (FWAA), Sporting News (TSN)., and Walter Camp Football Foundation (WCFF). Finally, a player can be recognized with the "Unanimous Consensus" honor if all five of the previously listed organizations have recognized that player as a First-Team All-American. Texas A&M has had 53 players that have been named First-Team All-Americans for a total of 72 seasons (19 players have been honored in two different seasons). 30 of those were Consensus All-Americans. Texas A&M has had 27 All-Americans on Offense, 34 All-Americans on Defense, and 11 All-Americans on Special Teams. The Linebacker position is the most represented position with 14 selections (Offensive Tackle/Offensive Guard is the next highest with 12 selections). Texas A&M has had an All-American selection at every position, and has had at least one All-American in every decade since the 1930s. The highest number of All-Americans during one decade took place from 1990 to 1999 when 16 players were named All-Americans for a total of 18 seasons. Aggie football fans call themselves the 12th Man, meaning they are there to support the 11 players on the field. To further symbolize their "readiness, desire, and enthusiasm," the entire student body stands throughout the game. In a further show of respect, the students step "off the wood" (step off the bleachers onto the concrete) whenever a player is injured or when the band plays the Aggie War Hymn or The Spirit of Aggieland. Seniors wearing either their Senior boots or Aggie Rings are also encouraged to join the "Boot Line." As the Fightin' Texas Aggie Band leaves the field after their half-time performances, seniors line up at the south end of Kyle Field to welcome the team back onto the field for the second half. The tradition began in Dallas on January 2, 1922, at the Dixie Classic, the forerunner of the Cotton Bowl Classic. A&M played defending national champion Centre College in the first post-season game in the southwest. In this hard fought game, which produced national publicity, an underdog Aggie team was slowly defeating a team which had allowed fewer than 6 points per game. The first half produced so many injuries for A&M that Coach D. X. Bible feared he wouldn't have enough men to finish the game. At that moment, he called into the Aggie section of the stands for E. King Gill, a student who had left football after the regular season to play basketball. Gill, who was spotting players for a Waco newspaper and was not in football uniform, donned the uniform of injured player Heine Weir and stood on the sidelines to await his turn. Although he did not actually play in the game, his readiness to play symbolized the willingness of all Aggies to support their team to the point of actually entering the game. When the game ended in a 22–14 Aggie victory, Gill was the only man left standing on the sidelines for the Aggies. Gill later said, "I wish I could say that I went in and ran for the winning touchdown, but I did not. I simply stood by in case my team needed me." In the 1980s, the tradition was expanded as coach Jackie Sherrill created the 12th Man squad led by 12th man standout Dean Berry. Composed solely of walk-on (non-scholarship) players, the squad would take the field for special teams' performances. This squad never allowed a kickoff return for a touchdown. Sherrill's successor, R. C. Slocum, amended the tradition in the 1990s to allow one walk-on player, wearing the No. 12 jersey, to take the field for special teams' plays. The player is chosen based on the level of determination and hard work shown in practices. Coach Dennis Franchione has continued Slocum's model, while also keeping an all-walk-on kickoff team that played three times in the 2006 season. Aggie Bonfire was a long-standing tradition at Texas A&M University as part of a college rivalry with the University of Texas at Austin, known as t.u. by Texas A&M students. For ninety years, Texas A&M students built and burned a large bonfire on campus each fall. Known within the Aggie community simply as Bonfire, the annual fall event symbolized the students' "burning desire to beat the hell outta t.u." The bonfire was traditionally lit around Thanksgiving in conjunction with the festivities surrounding the annual game between the schools. The first on-campus Aggie Bonfire was burned in 1909, and the tradition continued for the next 90 years. For almost two decades, Bonfire was constructed from debris and pieces of wood that Aggies "found," including lumber intended for a dormitory that students appropriated in 1912. The event became school-sanctioned in 1936, and, for the first time, students were provided with axes, saws, and trucks and pointed towards a grove of dead trees on the edge of town. In the following years the Bonfire became more elaborate, and in 1967 the flames could be seen 25 miles (40 km) away. In 1969, the stack set the world record at 111 feet (30 m) tall. In 1978, Bonfire shifted to a wedding-cake style, in which upper stacks of logs were wedged on top of lower stacks. The structure was built around a fortified centerpole, made from two telephone poles. Although tradition stated that if Bonfire burned through midnight A&M would win the following day's game, with the introduction of the wedding cake design Bonfire began to fall very quickly, sometimes burning for only 30 or 45 minutes. At 2:42 am on November 18, 1999, the partially completed Aggie Bonfire, standing 40 feet (10 m) tall and consisting of about 5000 logs, collapsed during construction. Of the 58 students and former students working on the stack, 12 were killed and 27 others were injured. On November 25, 1999, the date that Bonfire would have burned, Aggies instead held a vigil and remembrance ceremony. Over 40,000 people, including former President George H.W. Bush and his wife Barbara and then-Texas governor George W. Bush and his wife Laura, lit candles and observed up to two hours of silence at the site of the Bonfire collapse. The Bonfire Memorial was officially dedicated on November 18, 2004. Bonfire was postponed until 2002 in order to restructure it to make it safer. Delays in the development of a safety plan and a high estimated cost (mainly due to liability insurance), led A&M president Ray Bowen to postpone Bonfire indefinitely. Despite the university's refusal to allow Bonfire to take place on campus, since 2002 a non-university sanctioned Bonfire has burned annually. Known as Student Bonfire, the off-campus event draws between 8,000 and 15,000 fans. Student Bonfire utilizes many changes for safety purposes, and has only recorded two serious injuries since its inception, neither life-threatening. The newly designed stack was designed by a professional engineer (a former student) and features a center pole with 4 perimeter poles connected via "windle-sticks". In the new design, the height is capped at 45 feet (not including the outhouse), and all the logs touch the ground. Alcohol is strictly prohibited from all student bonfire functions as it was revealed that a number of the students working on the collapsed bonfire in 1999 had BACs higher than the legal driving limit. The Fightin' Texas Aggie Band marches in ATM formation during halftime at Kyle Field. Since its inception in 1894, its members eat together, sleep in the same dormitories, and practice up to forty hours per week on top of a full academic schedule. 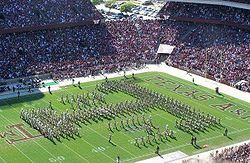 The Aggie Band performs at all home football games, some away games, and university and Corps functions throughout the year. Other events in which the band participated include inauguration parades for many United States Presidents and Texas Governors, major annual parades across the country, and the dedication ceremony for the George H. W. Bush Presidential Library. Midnight Yell Practice is a pep rally usually held the night before a football game. If the football game is to be held at Kyle Field, midnight yell takes place the day of the football game at 12:00 am If the football game is an away game, a yell is held on the Thursday night before at the Corps Arches on the Texas A&M campus, and Midnight Yell will be held in the city the game is being played. The term Wrecking Crew is a name given to defenses of the football team. The term, coined by defensive back Chet Brooks, became popular during the coach R. C. Slocum's tenure in 80s and the 90s. After the coach's firing, many fans, coaches, and sports analysts feel that recent Aggie defenses have not "earned" the title. Despite this, the university still owns a trademark on the term. Yell Leaders are five students who lead the crowd in yells during the games. The team consists of three seniors and two juniors elected by the student body. The Yell Leaders take the place of traditional "cheerleaders" and perform many of the same functions without the gymnastics and dance routines. They also participate in post-game activities such as being thrown in the Fish Pond if the team wins, or leading the student body in the singing of The Twelfth Man if the team loses. Texas A&M plays South Carolina as a permanent non-division opponent annually and rotates around the East division among the other six schools. ^ NCAA (2009). "NCAA Football Award Winners" (PDF). p. 16. Archived from the original (PDF) on June 11, 2010. ^ "SEC: Texas A&M to join in July 2012". Associated Press. September 5, 2011. ^ a b "Texas A&m Aggies". google.com. ^ a b c "Texas A&M Football History". 12thman.com. Archived from the original on January 4, 2015. Retrieved December 2, 2014. ^ "Charley Moran". College Football at Sports-Reference.com. ^ "E.H. Harlan". College Football at Sports-Reference.com. ^ "Texas A&M Aggies tell Big 12 they'll seek new conference". ESPN.com. ^ "Dana Bible". College Football at Sports-Reference.com. ^ a b "BIBLE, DANA XENOPHON". tshaonline.org. ^ a b c "BELL, WILLIAM MADISON [MATTY]". tshaonline.org. ^ a b "Homer Norton". footballfoundation.org. National Football Foundation. ^ a b "Homer Norton". College Football at Sports-Reference.com. ^ TaylorTRoom. "The More Things Change..." Barking Carnival. ^ "Harry Stiteler Named New Aggie Mentor". The Paris News. December 23, 1947. ^ "Texas A&M 1948 season". College Football Data Warehouse. Archived from the original on October 19, 2012. Retrieved May 5, 2010. ^ "Texas A&M 1949 season". College Football Data Warehouse. Archived from the original on October 19, 2012. Retrieved May 5, 2010. ^ "Texas A&M 1950 season". College Football Data Warehouse. Archived from the original on October 19, 2012. Retrieved May 5, 2010. ^ "Texas A&M Aggies". databasefootball.com. Archived from the original on April 12, 2010. Retrieved May 6, 2010. ^ a b c "Wholesale Resignations: Gray, Stiteler; Aggie Mentor Admits Knowing His Assailant". San Antonio Express. March 20, 1951. ^ "MYSTERY SHROUDS STITELER BEATING: Police Open Probe, Then Drop It". San Antonio Light. December 17, 1950. ^ "Footballers Give Stiteler Sendoff". San Antonio Light. March 21, 1951. ^ "Robert Harry Stiteler Records by Year". College Football Data Warehouse. Archived from the original on February 14, 2010. Retrieved May 5, 2010. ^ a b "Texas A&M University". google.com. ^ "Ray George". College Football at Sports-Reference.com. ^ "Texas A&M hired Bear Bryant for $15,000". Sporting News. ^ a b "ESPN Classic - Ten days in hell with the Bear". go.com. ^ "1956 Texas A&M Aggies". College Football at Sports-Reference.com. ^ "1957 Texas A&M Aggies". College Football at Sports-Reference.com. ^ "ESPN - NCAA College Football - Heisman 75". go.com. ^ "ESPN Classic - Bear Bryant 'simply the best there ever was'". go.com. ^ a b "Longtime Cowboys assistant Jim Myers dies at 92 - ProFootballTalk". nbcsports.com. ^ "Jim Myers". College Football at Sports-Reference.com. ^ "Hank Foldberg". College Football at Sports-Reference.com. ^ "Gene Stallings". College Football at Sports-Reference.com. ^ a b "1967 Texas A&M Aggies". College Football at Sports-Reference.com. ^ Weber, Bruce (February 10, 2011). "Emory Bellard, Creator of Wishbone Offense, Dies at 83" – via NYTimes.com. ^ a b c "Emory Bellard". College Football at Sports-Reference.com. ^ "1974 Texas A&M Aggies". College Football at Sports-Reference.com. ^ "1975 Texas A&M Aggies". College Football at Sports-Reference.com. ^ "1976 Texas A&M Aggies". College Football at Sports-Reference.com. ^ Los Angeles Times (February 11, 2011). "Emory Bellard: Emory Bellard, college coach who created wishbone offense, dies at 83 - LA Times". latimes.com. ^ "Year Won". 12thmanfoundation.com. Archived from the original on December 16, 2014. ^ "Tom Wilson". College Football at Sports-Reference.com. ^ Jr, Gordon S. White (January 20, 1982). "TEXAS A&M SIGNS SHERRILL TO RICHEST COLLEGE PACT" – via NYTimes.com. ^ a b c "Jackie Sherrill". College Football at Sports-Reference.com. ^ "Aggie Traditions - Twelfth Man". tamu.edu. Archived from the original on February 12, 2014. ^ "1985 Texas A&M Aggies". College Football at Sports-Reference.com. ^ "1987 Texas A&M Aggies". College Football at Sports-Reference.com. ^ "1986 Texas A&M Aggies". College Football at Sports-Reference.com. ^ "Slocum enjoys new role at Texas A&M". ^ "Sherrill Resigns From Texas A&M : Beleaguered Coach Cites Strain as Reason for Quitting". latimes. ^ a b c "USATODAY.com - Texas A&M fires Slocum after 14 seasons". usatoday.com. ^ "R.C. Slocum". College Football at Sports-Reference.com. ^ "College Hall of Fame Candidate R.C. Slocum Named 2011 Neyland Trophy Winner > National Football Foundation > NewsDetail". footballfoundation.org. ^ The Associated Press (December 6, 2002). "COLLEGE FOOTBALL; Texas A&M Hires Franchione" – via NYTimes.com. ^ a b c Eagle Staff (November 24, 2007). "Coach Fran timeline at Texas A&M". Bryan-College Station Eagle. Archived from the original on November 26, 2007. Retrieved 2007-11-24. ^ "2003 Texas A&M Aggies". College Football at Sports-Reference.com. ^ "2004 Texas A&M Aggies". College Football at Sports-Reference.com. ^ "Cotton Bowl History - Cotton Bowl Classic". goodyearcottonbowl.com. ^ "Franchione to donate $1 million for indoor sports facility". Houston Chronicle. ^ "2005 Texas A&M Aggies". College Football at Sports-Reference.com. ^ Davis, Brian (December 16, 2005). "A&M starts pumping up Darnell". Dallas Morning News. Retrieved November 24, 2007. ^ "2006 Texas A&M Aggies". College Football at Sports-Reference.com. ^ "California stomps Texas A&M in Holiday Bowl - USATODAY.com". usatoday.com. ^ Cessna, Robert (October 1, 2007). "Cessna: Talk around town all about Franchione". Bryan-College Station Eagle. Archived from the original on October 16, 2007. Retrieved 2007-10-01. ^ Harris, Terrance (September 27, 2007). "Franchione fends off negative vibes". Houston Chronicle. Retrieved September 28, 2007. ^ Riggs, Randy (September 27, 2007). "Dark clouds in Aggieland". Austin American-Statesman. Archived from the original on October 16, 2007. Retrieved September 28, 2007. ^ Taylor, Jean-Jacques (September 21, 2007). "Aggies trip on big stage again". Dallas Morning News. Retrieved September 28, 2007. ^ "Darnell Named Interim Head Football Coach" (Press release). Texas A&M Athletics. November 24, 2007. Archived from the original on 2007-08-13. Retrieved 2007-11-24. ^ "Sherman is on march". ^ "Sherman succeeds Franchione as Texas A&M coach". ^ "Texas A&M ready to debut new look on offense, defense". ^ "Sherman using old-school approach". Archived from the original on September 3, 2008. ^ "Aggies Mailbag: Sherman offers clue to future offense". Archived from the original on December 11, 2008. ^ "College a different challenge for ex-pro coaches". ^ "Five greatest quarterbacks in Texas A&M history: Why Ryan Tannehill, Stephen McGee don't make the list". June 5, 2017. ^ "Express-News All-Big 12 team". ^ "LSU vs. Texas A&M - Game Recap - January 7, 2011 - ESPN". ESPN.com. ^ "2010 Texas A&M Aggies Schedule and Results - College Football at Sports-Reference.com". College Football at Sports-Reference.com. ^ "Texas A&M extends Sherman's deal, ups money". ^ "Texas A&M won't fire Sherman, but he's feeling heat". star-telegram. ^ a b "2011 Texas A&M Aggies". College Football at Sports-Reference.com. ^ "Kansas vs. Texas A&M - Game Recap - November 19, 2011 - ESPN". ESPN.com. ^ "Texas vs. Texas A&M - Game Recap - November 24, 2011 - ESPN". ESPN.com. ^ "Texas A&M Aggies officially get accepted into the SEC". ESPN.com. ^ "Texas A&M Aggies fire football coach Mike Sherman". ESPN.com. ^ "Mike Sherman". College Football at Sports-Reference.com. ^ "Kevin Sumlin introduced as new Texas A&M Aggies coach". ESPN.com. ^ "Houston Cougar's Kevin Sumlin leaving for Texas A&M Aggies". ESPN.com. ^ "2012 Texas A&M Aggies". College Football at Sports-Reference.com. ^ "Johnny Manziel of Texas A&M Aggies wins 2012 Heisman Trophy". ESPN.com. ^ "Highest Final Rank Since 1956 for Texas A&M Football". Texas A&M University Athletics Department. ^ "Game Notes: Alabama - Texas A&M University Athletics Department". 12thman.com. ^ "Three Aggies Expected in NFL First Round". Texas A&M University Athletics Department. ^ "2013 Texas A&M Aggies". College Football at Sports-Reference.com. ^ "Duke Blue Devils vs Texas A&M Aggies - Recap". ESPN.com. Archived from the original on December 2, 2014. ^ "Kevin Sumlin to receive new 6-year deal from Texas A&M". Sporting News. November 30, 2014. Retrieved December 21, 2014. ^ Hairopoulos, Kate (December 16, 2013). "Contract details revealed for Texas A&M's Kevin Sumlin: Buyout raised to $5M if he leaves before 2016; no buyout thereafter". Dallas Morning News. Archived from the original on December 22, 2014. Retrieved December 21, 2014. ^ "Texas A&M vs. Alabama - Game Recap - October 18, 2014 - ESPN". ESPN.com. ^ "2014 Texas A&M Aggies Schedule and Results - College Football at Sports-Reference.com". College Football at Sports-Reference.com. ^ Taglienti, Michael. "Texas A&M Football: Aggies' Late-Season Struggles Are Cause for Concern". ^ "Texas A&M fires DC Snyder after 7-5 season". ^ "Source: DC Chavis exits LSU for Texas A&M". ^ "2015 Texas A&M Aggies Schedule and Results - College Football at Sports-Reference.com". College Football at Sports-Reference.com. ^ "Texas A&M vs. Louisville - Game Recap - December 30, 2015 - ESPN". ESPN.com. ^ "2016 Texas A&M Aggies Schedule and Results - College Football at Sports-Reference.com". College Football at Sports-Reference.com. ^ "Texas A&M vs. Kansas State - Game Recap - December 28, 2016 - ESPN". ESPN.com. ^ "College Football's Most Valuable Teams: Texas A&M Jumps To No. 1". ^ 2018 NCAA Football Bowl Subdivision Records (PDF). Indianapolis: National Collegiate Athletic Association. August 2018. Retrieved October 29, 2018. ^ "2018 Media Guide" (PDF). 12thman.com. Texas A&M Athletics. Retrieved October 30, 2018. ^ "1919 National Championships". College Football Data Warehouse. Retrieved January 5, 2008. ^ "Texas A&M Football History". 12thman.com. ^ "Texas A&M Bowl History". Archived from the original on September 25, 2010. ^ "Texas A&M In the Polls". College Football Data Warehouse. Archived from the original on November 18, 2007. Retrieved November 2, 2007. ^ "Texas A&M, Arkansas Establish Football Neutral Site Series in New Cowboys Stadium" (Press release). Texas A&M Athletics. March 10, 2008. Archived from the original on March 12, 2008. Retrieved March 10, 2008. ^ "Texas A&M vs. South Carolina: A historic rivalry in the works". September 30, 2016. ^ "Bonham Trophy has been hanging out at the Alamo". The Eagle. October 13, 2018. ^ "College Football Rivalries". Archived from the original on August 23, 2007. Retrieved March 31, 2007. ^ "More than a rivalry: Longhorns vs. Aggies defines Texas". ^ "All Time Results". MackBrownTexasFootball.com. Archived from the original on May 11, 2006. Retrieved July 11, 2006. ^ "Hex Rally". MackBrownTexasFootball.com. Archived from the original on March 12, 2007. Retrieved July 11, 2006. ^ Nikar, Jim. "Bevo". MackBrownTexasFootball.com. Archived from the original on July 1, 2006. Retrieved July 11, 2006. ^ "All-Time Football Scores: Baylor" (Press release). Texas A&M Athletics. Archived from the original on October 29, 2006. Retrieved March 10, 2008. ^ "All-Time Football Scores:Baylor". Texas A&M Athletics. Archived from the original on November 29, 2007. Retrieved March 25, 2007. ^ "History and Traditions". December 11, 2014. ^ "Previous Davey O'Brien National Quarterback Award Winners". Davey O’Brien Foundation. Archived from the original on December 7, 2006. Retrieved December 21, 2006. ^ "Chuck Bednarik Award: College Defensive Player of the Year - Past Recipients". Maxwell Football Club. Archived from the original on August 8, 2009. Retrieved January 5, 2013. ^ "A&M's Wallace Named Finalist for Rimington Trophy" (Press release). Texas A&M Athletics. November 28, 2007. Archived from the original on December 2, 2007. Retrieved December 6, 2007. ^ The Associated Press has selected an All-American Team since 1925. ^ The AFCA All-American Team has been selected since 1945 and has sometimes appeared under the name of its sponsor/publisher. ^ The Football Writers Association of America have produced an All-American Team since 1944. ^ Sporting News has selected an All-American team since 1934. ^ The Walter Camp Football Foundation has selected an All-American team since 1889. ^ "Twelfth Man". Texas A&M University. Archived from the original on December 29, 2006. Retrieved December 31, 2006. ^ The bleachers in Kyle Field were originally made of wood. Although they now are made of aluminum, "off the wood" is still commonly used to mean "get off the bleachers". Currently the Seattle Seahawks pay Texas A&M for the rights to use the 12th man. ^ Ivey, Tommi (October 19, 2005). "Aggies should not walk on A&M seal". The Battalion. Archived from the original on September 29, 2007. Retrieved August 20, 2007. ^ Hartsell, Jeff (August 29, 2006). "Citadel punter returns home for A&M game". Charleston Post and Courier. Archived from the original (– Scholar search) on September 26, 2007. Retrieved August 20, 2007. ^ a b c Cook, Beano (October 8, 2006). "Ten Days That Shook the Sport". ESPN. Retrieved July 26, 2007. ^ a b Heater, Jay (December 27, 2006). "LaMantia A&M's main 12th Man". Oakland Tribune. Archived from the original on October 22, 2008. Retrieved July 26, 2007. ^ a b c d Bernstein, Alan (November 18, 1999). "Aggie Bonfire holds distinction as Texas symbol". The Houston Chronicle. Archived from the original on December 25, 2007. Retrieved February 28, 2007. ^ "Vanities of the Bonfire". American Scientist. November – December 2000. Archived from the original on June 24, 2009. Retrieved February 28, 2007. ^ "Memories of an Aggie bonfire boy". Salon.com. Archived from the original on February 11, 2007. Retrieved August 14, 2007. ^ a b Cook, John Lee, Jr. "Bonfire Collapse" (PDF). U.S. Department of Homeland Security. Archived from the original (PDF) on February 7, 2007. Retrieved March 3, 2007. ^ Burka, Paul (April 2000). "The Aggie Bonfire Tragedy". Texas Monthly (Vol. 28, Issue 4 ed.). p. 116. ^ Whitmarsch, Geneva (November 26, 1999). "Thousands Mourn Fallen Aggies". The Bryan-College Station Eagle. Archived from the original (– Scholar search) on December 15, 2004. Retrieved February 28, 2007. ^ Mfon, Tosin (November 19, 2004). "A&M remembers bonfire tragedy". The Daily Texan. Archived from the original on September 2, 2007. Retrieved March 3, 2007. ^ Milloy, Ross E. (February 5, 2002). "Southwest: Texas: Aggie President Cancels Bonfire". National Briefing. The New York Times. Retrieved March 3, 2007. ^ "Off-campus Texas A&M bonfire brings out thousands". The Badger Herald. November 26, 2002. Archived from the original on November 10, 2007. Retrieved March 3, 2007. ^ Moghe, Sonia (November 17, 2005). "Off-campus bonfire". The Battalion. Archived from the original on September 26, 2007. Retrieved March 3, 2007. ^ "The Fightin' Texas Aggie Band". AggieAthletics.com. Archived from the original on November 29, 2007. Retrieved June 13, 2007. ^ "Traditions". The Former Students Association. Archived from the original (WMV) on December 6, 2006. Retrieved June 13, 2007. ^ Foley, Sara (January 1, 2005). "RVs, Texas A&M U. band to attend Bush's inauguration". The Battalion. Archived from the original on September 9, 2005. Retrieved June 14, 2007. ^ "About the Band". Aggieband.org. Archived from the original on June 7, 2007. Retrieved June 13, 2007. ^ Donald B. Powell; Mary Jo Powell. (1994). The Fightin' Texas Aggie Band (Centennial Series of the Association of Former Students, Texas A&M University). Texas A&M University Press. ISBN 978-0-89096-595-5. ^ Ruff, Brian (September 30, 2001). "Wrecking Crew salvages A&M season opener". The Battalion. Archived from the original on September 7, 2009. Retrieved February 17, 2008. ^ a b Griffin, Tim (July 28, 2008). "Revisiting the 'Wrecking Crew' and 'Blackshirts'". ESPN. Archived from the original on September 20, 2008. Retrieved December 3, 2008. ^ Onan, John (March 6, 2006). "Aggies defense must earn "Wrecking Crew" label". Real Football 365. Archived from the original on September 6, 2009. Retrieved December 3, 2008. ^ "Texas A&M University Trademarks". Texas A&M University. Archived from the original on January 30, 2009. Retrieved December 3, 2008. ^ "Texas A&M Aggies Football Schedules and Future Schedules". fbschedules.com. Retrieved May 16, 2012. 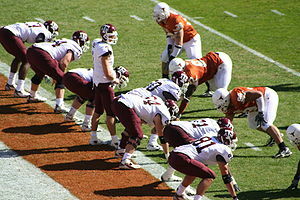 Wikimedia Commons has media related to Texas A&M Aggies football.